This topic provides information about the April 2019 release of Dynamics 365. 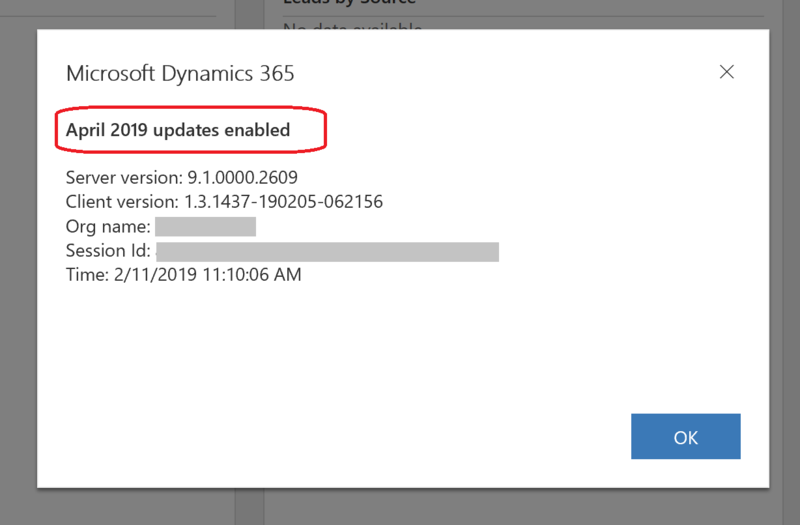 Preview available February 1, 2019 Try new capabilities in the April ’19 update before they are deployed in production. Learn more in the Frequently asked questions later. On January 21, 2019, the April 2019 release notes was published with the initial list of all the features we are shipping as part of Dynamics 365 and Power Platform. On February 21, 2019, the release notes was updated to include new apps and features that are available in April 2019 release. Bookmark this URL (https://aka.ms/businessappsreleasenotes) to access the release notes. Starting February 1, 2019, we will enable the April 2019 features as a preview for customers to try out in a non-production environment before those features are deployed in production. The release notes will call out the list of features that will be available for preview. If you are using Dynamics 365 for Customer Engagement apps (Sales, Service, and Marketing), check this article to know the list of features available for early access and how to opt-in to the preview. If you are using Dynamics 365 for Finance and Operations or Dynamics 365 for Retail, check this blog to know the list of preview features. Why should I enable and test the preview ahead of time? As part of the new Dynamics 365 release cadence, we are deploying two major updates a year—in April and October—to all of our customers. The preview provides you with an opportunity to validate the update in your sandbox environment before it is applied to your production environment. The preview also gives you an opportunity to experience the new features in advance and confidently roll them out to all your users. If you are using Dynamics 365 for Customer Engagement apps (Sales, Service, and Marketing), you can enable the preview features from the Power Platform Admin center. 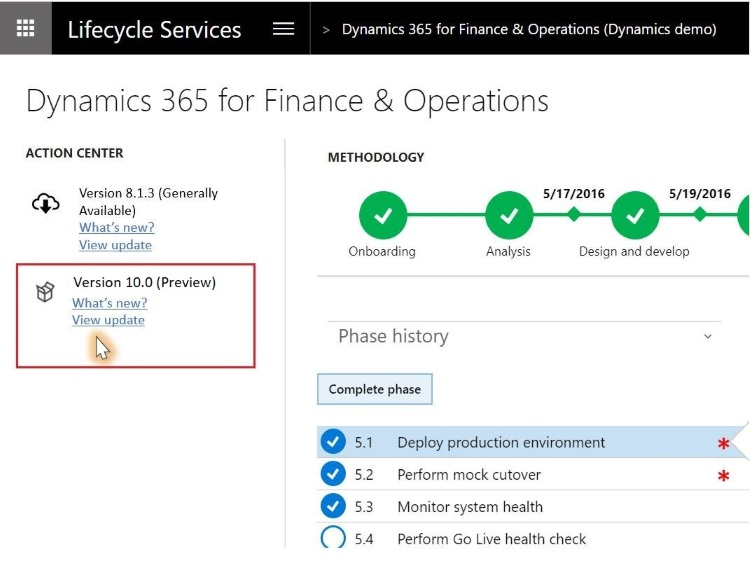 If you are using Dynamics 365 for Finance and Operations or Dynamics 365 for Retail, you can enable the preview features through the First Release program in Lifecycle Services. Note that the exact terminology and content used in this screenshot is a work in progress and might change. Which environments do I use for previewing the features? You can choose to preview the features in one of your sandbox environments. 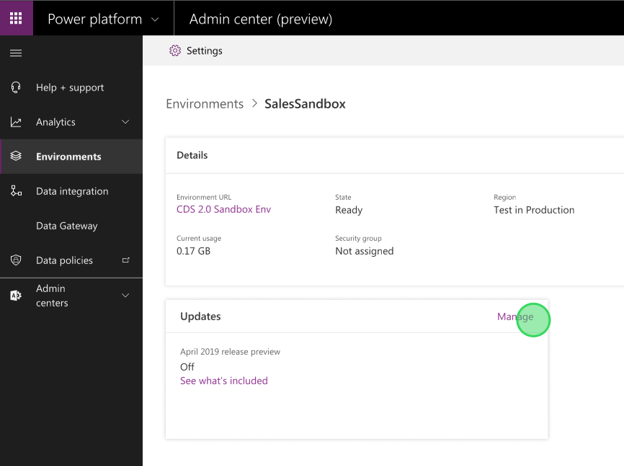 In addition to the sandbox environments, if you are a customer of Dynamics 365 for Customer Engagement apps, you can preview the features in production environments. We highly recommend previewing these features in a sandbox or trial environment prior to production. To get the full experience of the new features, we also suggest that you create a copy of your current production environment or database (for Dynamics 365 for Finance and Operations or Dynamics 365 for Retail) as a test or sandbox environment to try out the new features and experiences. What features and experiences are available for preview? The preview features and experiences will be listed in the April 2019 release notes. By enabling the April 2019 preview, you'll be able to try out the new features in Dynamics 365 for Customer Engagement platform and apps (Sales, Service, and Marketing), Dynamics 365 for Finance and Operations, or Dynamics 365 for Retail. 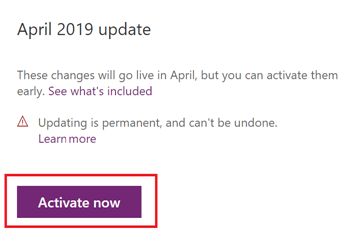 How can I identify whether my environment has preview enabled for the April 2019 release? Admins can access the Power Platform Admin center to see whether the preview is enabled for a specific environment. Users can see “April 2019 (preview)” on the About page for the environment. If you are a customer of Dynamics 365 for Finance and Operations or Dynamics 365 for Retail, you can view the availability of the preview (First Release) in the Action center in Lifecycle Services as shown below. How do I turn off the preview features once the preview is enabled? If you want to opt out of a preview, you can roll back your preview instance. If you are a customer of Dynamics 365 for Customer Engagement apps, you can reset the preview environment to factory settings, or restore to an earlier backup. It is not possible to disable the preview features in an existing environment. If you are a customer of Dynamics 365 for Finance and Operations or Dynamics 365 for Retail, you can redeploy or restore the database on that environment. How do I report bugs in the preview environment? You should follow the current process of reporting bugs through Microsoft Dynamics 365 support. We will prioritize and fix the blocking bugs before we deploy the update in production. What happens to these preview features in April 2019? The preview features will become generally available on April 5, 2019, and by default will be deployed in all customers’ environments over the month of April. How will the April 2019 release be deployed to all customers? Dynamics 365 for Customer Engagement apps: Over the course of April, all environments will be turned “on” to receive the April 2019 features. The updates will be deployed on your enivornments automatically following our Safe Deployment Process (SDP). If you want to enable the April 2019 features before the update reaches your region, you can enable the updates yourself by opting in to the preview between February 1, 2019, and the date your region will be scheduled to have the features turned on. However, by the end of April, all instances will have had April '19 features applied. To know the list of features and how to opt-in to the features, check here. This gradual rollout is a last safety measure to catch any potential issues as we apply the changes to all instances. It is the same approach we do for our regular patches and updates. In the coming months, we will publish the specific date of when the features will be enabled for each customer. Dynamics 365 for Finance and Operations or Dynamics 365 for Retail: You can configure the maintenance day and time windows in Lifecycle Services (LCS). You'll receive an email if you opt in to receive LCS notifications. You'll be able to select the designated tier 2 sandbox for the update. The sandbox environment will be updated followed by the production environment. You'll have five business days for testing and validation. See the One Version service updates FAQ for more details. Will the April 2019 release be applicable to on-premises? Dynamics 365 for Customer Engagement apps: The update does not apply to on-premises customers. The April 2019 release will be applicable for the customers of both commercial and the Government Cloud. Dynamics 365 for Finance and Operations or Dynamics 365 for Retail: The April 2019 release is applicable for on-premises as well. You can opt in to preview the new functionalities similar to online. How does Microsoft ensure the reliability of these features? Dynamics 365 for Customer Engagement apps: The quality of our releases is paramount to ensuring our customers’ satisfaction. We have multiple parts to how we approach quality as we release to our global audience. We begin our process with a series of automated and manual tests across a wide variety of scenarios. This progresses to the group of customers in multiple regions participating in our First Release program, where those customers work in conjunction with the FastTrack program on validating key scenarios on the builds scheduled to be deployed. This is followed by our robust Safe Deployment Process (SDP) that phases deployments over several weeks, gradually rolling out changes across the entire customer population. The Safe Deployment Process allows us to continue to validate and monitor the release as it progresses, and provide slip-streamed fixes, if needed. This provides the flexibility to quickly respond to any issues that might be found, and to update a build before it reaches additional customers. Dynamics 365 for Finance and Operations or Dynamics 365 for Retail: We ensure the quality of the release by adhering to a fundamental principle that’s enabled through a series of progressive, rigorous, and automated validations as described in Standard and First release service updates. If I have further questions or feedback, where can I post them? For any questions or feedback, we recommend that you join the discussion at the Release Readiness Forum in the Dynamics 365 community.